Home News What did the first quarter have in store for blockchain technology in the realm of online news and social media? During the first three months of the year, the blockchain technology was mentioned more than 3000 times, which is dwarfed next to the mention number of cryptocurrencies (which came up 23,000 times between november and january), so this mention number is not outstanding accounting for the fact that tech topics, such as this one, can enjoy immense popularity. 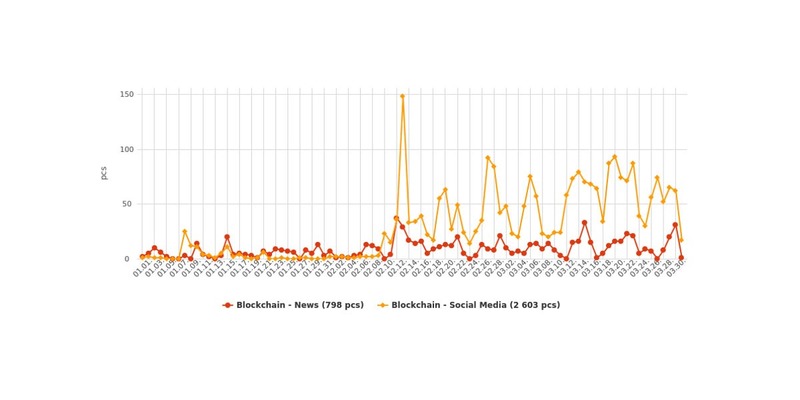 The spread of the approximately 3300 mentions is far from even: at the start of the year, right until mid-february, the web was quiet about blockchain technologies. This is especially true for social media sites, as the entirety of the online discussion around this topic came from the publication of 10-20 news articles a day. 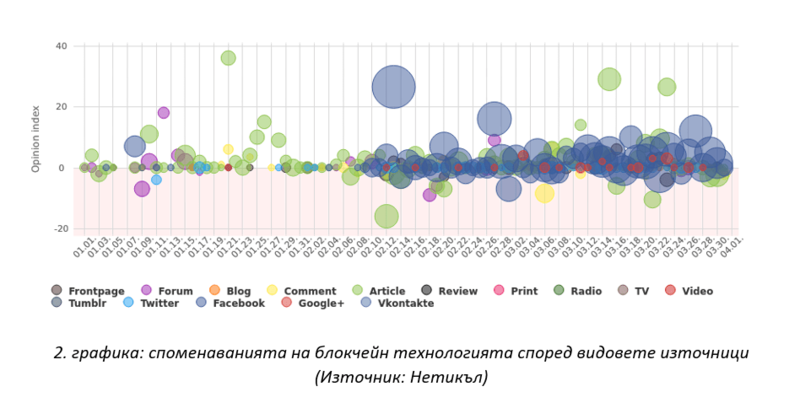 However, according to the data from Neticle, the topic generated significantly more interest in February; the remaining one and a half months saw an average of 50-100 mentions per day. There was also a change in platforms: from early february, social media comments overtook news pieces: Facebook became the primary channel for discussion around this topic. How did this switch affect the overall assessment of the topic? Truth to be told, it did not at all, the opinion on this technology improved continuously, without significant fluctuations, meaning that there was no publication or debate in the online press or social media that would have drastically changed the positive view people had of this technology. Online news sites and social media platforms both had either a neutral, or slightly but consistently positive tone. There is no significant difference between the opinions of journalists and social media users, only the extent of their optimism differs. But let’s take a closer look at the data. What did the press concentrate on, and what caused the stir on social media? A bit less than a quarter of the mentions (23%) comes from online news platforms, and although the dispersion of these mentions is more even than those from social media sites (see Figure 1), the online press also published more on the topic during the second half of the time period in question than in the first half. There are two quantitative spikes in the mention number that are worth talking about. The press perked up on February 12th, when SoftUni, a leading IT company in Eastern Europe announced their partnership with an organization under the name of Academy School of Blockchain, who are the first ones on the globe to provide accredited blockchain training. March 15th brought multiple related content, that grabbed the attention of journalists: SoftUni’s ambitious plans were still discussed, as well as the fact that more and more companies are starting to use or support this new technology (Jarvis Edge, and earlier IBM and Maersk as well). News of the first ever blockchain powered election was making headlines too, which was later refuted by the government of Sierra Leone in a statement. These positive mentions send multiple messages to regular media-consumers: this technology is spreading rapidly, leading companies are giving it their vote of confidence, and finally the launch of related training shows the interest and initiative of bulgarians. Therefore, it is not surprising that the Web Opinion Index of the blockchain technology was positive all the way through. The slight drop in the index in early february is due to to the speculations around cryptocurrencies and to the fluctuations of their stocks, which might have indirectly affected the opinion people have on the technology behind it, which in turn, can dampen the force of blockchain innovation. The other negative aspect the press brings up, is that the technology can be dangerous due to the energy shortages of the region, but these are not strong enough voices to significantly affect the general opinion. Only about 7% of the mentions from news sources was negative, as opposed to 17% on the positive side. As we mentioned above, three thirds of the mentions come from social media platforms, with more than 2600 hits. However, Facebook communication only took off in early February, until then only the press showed real interest in the topic. Facebook was the most popular, hosting 65% of all mentions; non of the other channels were notable, forums produced less than 5% of the mentions, comments under articles 3%, and tweets a mere 3% as well. So Facebook is without a doubt the platform where the most active discussions happened regarding this topic. Within the Facebook realm, the opinion sharing started within finance and cryptocurrency groups, and under relevant articles and debate-inspiring posts. This technology is positively regarded not only in the news, but on social media as well (See Figure 3). The commenters highlight the possibility for decentralization, the simplification of financial processes and for making personal data storage more secure. On the other hand, the negative comments are about the legality of, and support for blockchain: many of them express doubt whether the bulgarian government will actually recognize the potential in this technology. Overall, the data from Neticle shows that as long as the media concentrates on the practical aspects of blockchain which suggest the rapid spread (through trainings and its application in corporate environments), then personal opinions on social media will dominate this discussion, debating whether it is worth to use blockchain, and take advantage of its decentralized, fast and secure nature. Are you interested in another topic? We are happy to help!